We’ve all heard the term hands-free plenty these days when it comes to cell phones and driving, but that term is rarely used when talking about print finishing or bindery equipment – especially with tabletop business card slitters that offer gutter cuts. 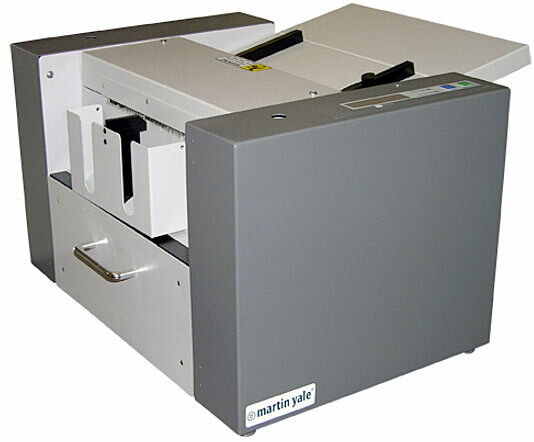 Martin Yale is changing that with their newest business card cutting machine. Here is how cutting your business cards would go. Imagine placing 40 sheets – each printed with 10 business cards on them with gutters. Then you press the Start button on the Martin Yale GC10 Slitter – that’s it. In a few minutes, you have 400 business cards trimmed down, complete with full bleeds on all 4 edges! The GC10 is a single pass machine that automatically feeds and advances your sheets – slitting the sides of the cards while a rotary blade travels the width of the sheet cutting the tops and bottoms. The finished cards fall into a collection bin and all of the waste strips are deposited into a lower waste drawer in the machine. Does it all sound too good to be true? Sure it does, but we were very surprised when Martin Yale brought us a machine to demonstrate. As proof, watch the video below that they have prepared and we think you’ll be just as impressed as we are with the GC10 Business Card Slitter.